Diamond Trust completed QA testing and was locked down into its master revision back on October 3, 2011. Yeah, I'm looking at the calendar too---it's been a really long time. So, what's been happening for the past seven months? Short answer: the Nintendo Approval Process. The long answer is a bit more complicated, and it's kindof a funny story, but it's also kindof a non-disclosure-agreement-shrouded story. Suffice it to say that "negotiations" were involved. 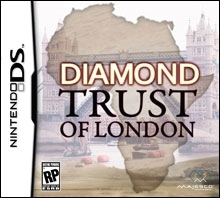 The good news is that Diamond Trust came out the other end of that dark tunnel mostly unscathed, unless you take a look at the new, official title of the game, which was necessary to make the whole thing go through: "Jason Rohrer with Music by Tom Bailey: Diamond Trust of London"
Finally, the game also passed through Nintendo's Lot Check testing process without any hitches. And that means it's all ready to be manufactured. There will be a big announcement about the manufacturing plans soon (hint: retratskcik). I'm on the verge of turning my master ROM in to Nintendo to start the lotcheck process, and the final piece to fall into place has been the full soundtrack. Whereas the QA ROM had only three songs in place, the final game has a full set of ten. But by "songs," I don't mean manually-arranged pieces of music in the traditional sense. Ten linear songs wouldn't fit on a DS cartridge anyway, even if we wanted to do it that way. Yes, we're using the largest available cartridge size, but we've squeezed something like 20 hours of unique musical moments into that space. We did this not through compression, but instead by making the music arrangement dynamic and procedurally controlled. A "song" in Diamond Trust is a folder full of loops that is fed into the music engine. The engine arranges the music in realtime based on the current state of the game. As I worked on this rather simple engine and witnessed how easily Tom could fit a wide variety of music compositions into it, I was reminded of Chris Hecker's Structure vs. Style dichotomy. In this case, the music is broken down into a well-defined, structured format that my code can easily (and blindly) handle, but it's flexible enough to permit all sorts of stylistic variation and creative control on the part of the musician. This approach grew out of necessity: how do you make a soundtrack for a short game that people will play over and over? There are no cutscenes or set pieces to hook traditional film score moments onto. And just playing looping songs gets grating quickly. Full-on computer-generated music (like that from Inside a Star-filled Sky) can be endless without grating repetition, but the themes and presentation in Diamond Trust demanded musical styles that are impossible to generate completely procedurally. Plus, I needed a system that was compatible with Tom's well-developed music production habits (which include the recording of real musical instruments and human voices). The resulting system can also be seen as one that wrings a huge amount of musical variety from a small base set of hand-crafted source material through sheer combinatorics. Yes, I said 20 hours of unique musical moments, but those moments are strung together into practically infinite variations of song arrangements. As part of the milestone I recently submitted into QA testing, Tom was able to finish three interactive tracks. My music engine is loop based, and to develop songs for it, Tom has been putting together brief music sketches for each potential song, like musical reference points. He then builds loop sets for the music engine using each sketch as a guide. After that, he can hear his music made dynamic and interactive by the music engine and tweak the loop set as needed. I've been traveling with my family for a few weeks, but right before I left, I submitted a feature-complete version of Diamond Trust to Zoo and indiePub so that they can get started on QA in preparation for Nintendo's Lot Check process. There are no known bugs at this point, and the game passes all of the Lot Check requirements as far as I can tell. 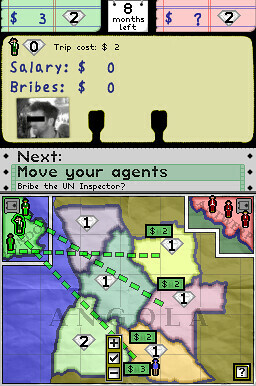 Work in this phase involved finishing up clone boot support for Download Play off of a single DS card, replacing some of the last remaining placeholder graphics (including some of the fonts), adding in-game help pages, and developing the music engine. Tom was able to get three interactive songs done in the music engine for this milestone, and he hopes to have a bunch more included in the final release. All of the screen shots in this post are from the Beta that was submitted to Zoo. More details about the graphical updates are interspersed below. I wanted all the graphics in the game to feel consistent. I already had bits and pieces of antiquated office life in place, with ledger paper, Rolodex cards, and tear-off calendars, but other parts of the presentation didn't fit into that metaphor, especially where the variable text messages were concerned. I had white text just floating in black space, with an off-the-shelf font that I wasn't happy with. The first step was to design a custom font. Then I switched over to a simulation of dot-matrix printing on "green bar" paper, reminiscent of the work my mother would bring home and spread on our kitchen table during that era. But I was still stuck when it came to lettering on the Rolodex cards and ledger paper. Dot matrix printing on those didn't make sense. I eventually scanned my own handwriting and made a "blue pen ink" font out of it. I'm actually not a fan of "fake" handwriting fonts, because their fakeness can be spotted whenever the same letter repeats within a single word (see the repeated word "Will" in the screen below). In this case though, I was stuck, because baked "real handwriting" samples of the various phrases would make future localization really difficult, and also wouldn't work for the handwritten numerical displays, which must be font-based anyway. In addition to the ROM submitted to Zoo, I also had to submit samples of the "special box inclusions" for approval by Nintendo. I'm not going to say too much about them now (or ever, maybe, because surprises are great). Suffice it to say that the planned box inclusions are totally unprecedented in the history of boxed video games, which is why I'm a bit nervous about Nintendo approval. Returning to work on a project after more than a year of not touching it was difficult. Motivation and momentum are fleeting resources. There were only a few things left to do, but one of the biggest things looming over my head was music. It was clear that my usual (!) realtime-program-synthesized, chip-tune-style music wouldn't be a good fit. I had originally planned on recording some real-instrument studio stuff myself, but my enthusiasm for that plan had waned over the year. This is my first time collaborating on a game project, and it has really helped to restore my creative momentum. Diamond Trust surfaced briefly in 2009 and then disappeared completely for quite a long while. A few people emailed me during that time to find out what happened, but I generally kept quiet about it. Small bits of information appeared in various interviews. And now Diamond Trust is back in full view again. So what happened? I'll try to summarize. Back in 2009, shortly before GDC, Majesco approached me by email and phone about making a game with them. We scheduled a face-to-face meeting during the week of GCD. On my way to the meeting in Majesco's hotel suite, I met Auriea and Michael from Tale of Tales in the elevator---also on their way to a meeting with Majesco. Majesco was certainly branching out in some unexpected directions. 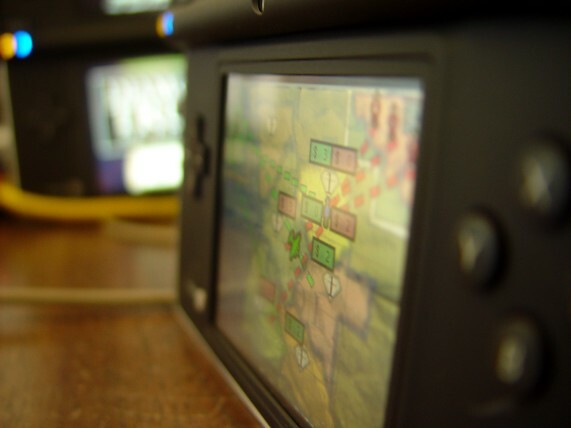 During my meeting with them, they proposed the idea of a cartridge-based DS game. 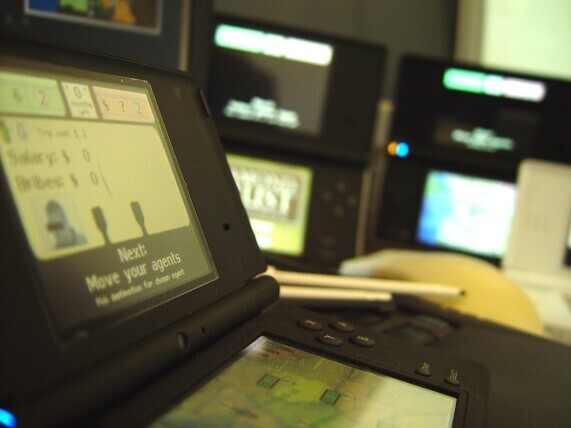 The Nintedo DSi's release was right around the corner, and if my game took advantage of DSi-specific features, like the camera, it would have a marketing advantage. At the time, I was keenly interested in two-player games, and Majesco was enthusiastic about strategy games on the DS (their Age of Empires game had apparently sold well). I came home from GDC with the task of coming up with a concept for a two-player DS strategy game. And of course, the DS with it's wide reach (100 million units) and small screens (256x192) was a perfect fit for a niche game made by a single person. 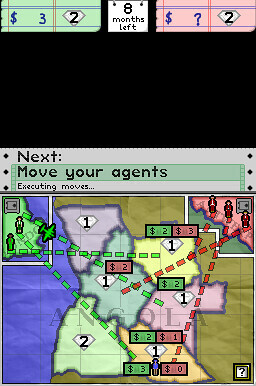 As I thought about two-player, turn-based strategy games on computers, I wanted to get beyond the idea of simply playing a board game on a computer, because I couldn't see a substantial reason for doing that (simplified bookkeeping?). 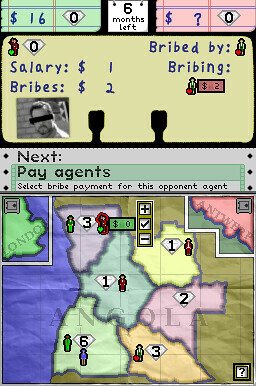 If two players were on two separate screens, however, computers brought something new to the table: players could have completely different views of the game state. 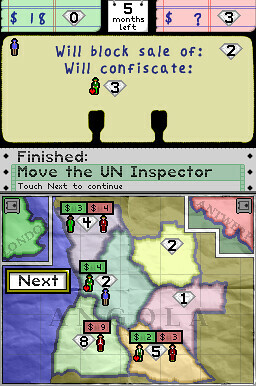 Interesting spy mechanics, which are impossible in board games, become possible on computers. And the DS, with it's local WiFi and matchmaking, was perfect for this two-view setup. In April, I submitted a concept to Majesco called Deception about cheating spouses who are both secretly filing for divorce against each other and hiring private eyes to tail one another to gather evidence for the divorce. And hiring private eyes to follow each other's private eyes. All sorts of juicy mechanics were possible when a player doesn't know what the other player knows about what she knows. Given the theme, however, Majesco---not at all surprisingly---said "no." I went back to my notebook, still thinking about the same mechanical space, and in May I came back to them with a second concept called Diamonds about spying and bribing diamond traders operating in Angola on the eve of the passage of the UN's Kimberley Process for diamond certification. By July, we had a signed contract, and by August I had a dev kit and the necessary office (a Nintendo requirement). I turned in regular milestones in October, November, and December, bringing the game to a gameplay-complete state for both one and two-player modes---just needing music and a tutorial. At some point in early 2010, for reasons that I don't know, discussion from Majesco started turning away from "cartridge" and toward "DSiWare," Nintedo's new downloadable service. Looking at the wording in my contract, there was no specific mention of cartridges in writing. 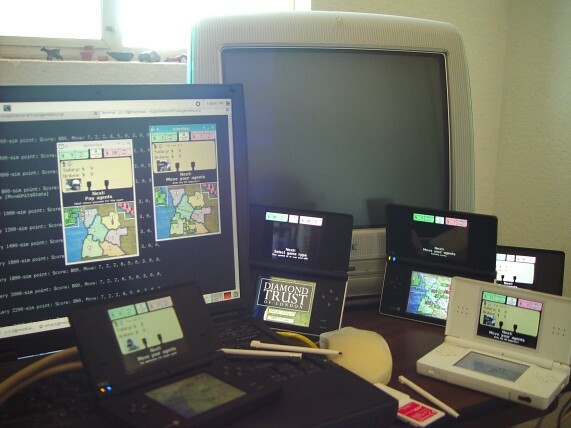 I did some research about DSiWare and was disappointed: it had a narrow reach (only 10 million units) and poor sales numbers. Not only would my game likely not sell well on DSiWare, but my existing fans would be unable to get the game without buying DSi units. You know, everyone has a DS lying around. Very few people have a DSi. Edit: I just noticed that they stuck London Bridge on the cover there. Clip art rocks. At that point, they kept asking when I was going to turn in the next milestone, and I kept pushing for a guarantee of cartridges instead of DSiWare. That went on for a while, but kept myself busy by working on and releasing Sleep Is Death. In March, I ironically gave a keynote at the GDC Serious Game's Summit about Diamond Trust. By May, it became clear that Majesco and I were at an impasse, and we wound down the project. I closed my office and sent back the dev kit. And there Diamond Trust sat. The GameStop pre-order page eventually disappeared. I worked on other stuff. Oh well. Lessons were learned. In September of 2010, I signed up to do some consulting work with a new agency called Gun. In October, they brought some potential work my way for Zoo Games and indiePub. I can't even remember what the work entailed anymore. But at some point in the initial phone call, the Gun guys were asking if I knew of any indie games that needed publishing help. I took a look at the Zoo website, saw that they published lots of DS games, and tossed my languishing Diamond Trust project into the discussion. I sent Zoo a ROM through Gun, and Zoo expressed interest. In fact, Zoo's interest was so vigorous that a dev kit showed up in November before I even had a meeting with them. In December, I had a great phone call with Zoo's CEO Mark Seremet where we ironed out the details. Unlike the guys at Majesco, Mark was interested in pursuing a limited-run, Amazon-only release instead of shipping a few copies to every GameStop in the country. A niche game needs to reach each and every member of its niche audience to be successful. Mark was also interested in making the limited edition special---signed and numbered, special inclusions in the box, and so on. He seemed to get it. My conversation with him was a breath of fresh air. So, Diamond Trust came back to life after all, nearly a full year after it started to wither. As the game has neared completion, Zoo has continued to be great. Though I did get the "we will actually make cartridges" part in writing this time.